Variolae Vaccinae – the birth of the fraudIn May 1796, Edward Jenner, acting upon ‘a superstition among the dairymaids of Gloucestershire that a person who had suffered from cowpox would never have smallpox,’ 1 inoculated one James Phillips with lymph from a cowpox vesicle on the hand of a dairymaid: in June he inoculated the boy with smallpox. The more people are vaccinated, the less people come down with the infectious illness targeted by that vaccine and that therefore less people die from that illness. Or, stated more formally, there should be a negative correlation between the variables of, on the one hand. vaccination percentage, i.e. number of vaccinated people per some population number, versus, on the other hand, disease rate or disease death rate, i.e. the number of people coming down (and dying) with the illness per that same population number. 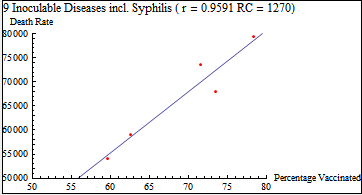 It is a logical requirement that causation implies correlation: If A causes B then A and B must correlate. Therefore, if a negative correlation is absent between vaccination percentage and illness death rate, then it can be rightfully inferred that in turn, vaccines do not cause reduction of the targeted illness and therefore it would be unwarranted and, given the risks of taking them, indeed unethical to use them as a means of preventing illness. Moreover, if there would be a positive correlation then this would be a compelling reason for not taking vaccines. Stated in simple terms: there’s no point in taking a vaccine that doesn’t work (zero correlation). Moreover, if they make you sick instead (positive correlation) then this would precisely be a reason for not taking them. This is only basic “common sense” logic, right? The method I used was adopted from elementary statistics. A data point consists of two dimensions or variables: Vaccination Percentage and Death Rate. 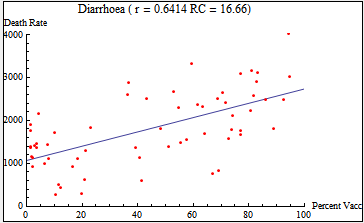 For any set of data points, I have computed the regression number, r, and a simple linear fit, RC (slope). The stronger the vaccination percentage and the death rate are positively correlated, the closer r will approach 1 from below. 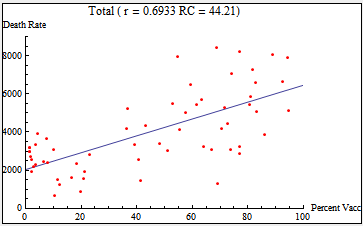 If the correlation is negative, r will approach -1 from above. 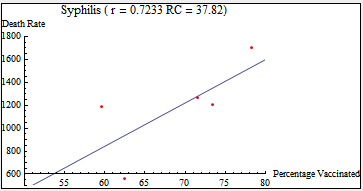 By definition of r, its absolute value never exceeds 1, a situation in which both variables have a perfect linear relationship. If vaccines are really meritorious one would expect negative regression numbers where the linear fits would have negative slopes. TABLE 1. See Graph A. TABLE 35. (See Graph D.) INOCULABLE DISEASES. As is plainly evident from these graphs, with respect to the evidence reviewed at least, vaccines do not give the protection they should. In fact, with the exception of one (Diphteria), vaccination percentage is positively correlated with death rate. In other words, more people die when more people receive vaccines. As such this finding lends validity to the idea that vaccines cause rather than cure disease. "It will be seen from the foregoing table that 75,310 cases of diphtheria were treated with anti­toxin, with an average fatality-rate of 13.28 per cent. ; and that 13,135 cases not so treated yielded an average fatality-rate of only 5.65 per cent.—a relative difference of nearly 58 per cent, in favour of the latter, and hence damaging to the claims made by the advocates of anti-toxin. But this is not all. From foot-notes to the tables in the reports, we find that of the 742 deaths in cases not treated, no fewer than 137 were moribund, and recovery hopeless on their admission to the hospitals, while there were at least 92 deaths from diseases other than diphtheria. This proves that low as was the average fatality-rate of the cases not treated with anti-toxin, it is also unfairly saddled with all the worst and absolutely hopeless cases. In addition, a number of deaths from other causes which ought in common fair­ness to have been excluded are actually included in the non-treated class, the elimination of which would have led to a further reduction of the non-treated fatality-rate." “LEICESTER: Sanitation versus Vaccination” By J.T. Biggs J.P. While from 1960-1980 flu deaths were well on their way to oblivion, the introduction of the flu vaccine visibly reversed this trend. To answer the title question: Vaccines, Cure or Cause? At least based on the reviewed historical and recent evidence, it is clear that not only do vaccines not cure the disease, they precisely cause the disease. Vaccinations do not impart permanent immunity from the diseases they vaccinate against. Most modern studies show that a high percentage of people who were vaccinated as children have no stored immunity by the time they reach adulthood in their late teens or early twenties. When exposed to the diseases at this later age, they usually have a much more serious case of these illnesses, which can be fatal more often than when the diseases are acquired naturally as children. Most epidemic-level outbreaks of the various diseases our society is vaccinating against are taking place among fully-vaccinated children. Even in the short-term, where vaccinations have been effective at reducing disease incidence, the immune effects are not universal and more and more children are getting sick anyway. In other words, children are being exposed to the risks of vaccination without the benefits of either short-term or long-term immunity. In roughly the last 30 years, for example, every case polio in the U.S. has been among previously vaccinated individuals. the risks of side effects from vaccinations now appear to be higher than the risks of serious side effects from the naturally acquired childhood diseases. There still needs to be additional epidemiological research done in this area, but the preliminary findings are pointing in this direction. This will be especially true when the actual long-term side effects of an altered, hypo-functioning or dysfunctioning immune system are included. This will include conditions such as auto-immune diseases and cancer, all of which are now at epidemic levels in the U.S. and elsewhere where vaccinations are widespread. What Does Cause Reduction in Disease Incidence? Since infectious diseases have vanished independent from the intervention of vaccines, it should then be asked what the real causes are for their disappearance. Today, we know that sanitation makes a tremendous contribution to preventing disease and keeping people healthy.But is wasn’t always that way. Throughout most of our history, sanitation practices were practically nonexistent. Yet the history of sanitation dates back at least 7.000 years, to the Babylonians, Egyptians, Greeks, and Romans. In New York City, living conditions were as nearly as filthy as in the middle ages, and yearly epidemics swept through populations, killing many. The average life span was less than age 40. But during the mid 1800’s, it was discovered between germs and disease was proven. Soaps, disinfectants, and pharmaceuticals began to be developed, and it was first recognized that disease could be controlled. Here are a couple of graphs together with the comments by the author, a vaccine advocate, who admits there are quite a few infectious diseases that have significantly diminished due to improvements in hygiene, nutrition, sanitation etc., prior to the arrival of vaccinations specific for those diseases. The serious epidemics and infectious illnesses which prompted the move to develop vaccinations were caused by poor sanitation and nutrition, in other words, by living in un-natural manners. It was a return to clean natural living and hygiene which were the most significant factors for the eradication of these illnesses and not the introduction of un-natural vaccines. If you choose to not vaccinate your children it is important to be sure they eat a healthy diet with all the Essential Nutrients and avoid immune suppressing food items like white sugar, candy, sweetened breakfast cereals, sodas and french fries or other junk food cooked in bad fats. Most parents will want to do this anyway when they learn just how un-healthy these over-processed foods really are. Strong Nutrition and Immune System, Allow Child to Catch Diseases Naturally. If you or other children in your family have shown strong vitality and most of your child’s illnesses are short and relatively benign, he or she is probably an excellent candidate for this option. In this case, treat the illnesses when they arise with homeopathy, herbal medicines or other natural means which support the natural immune process. Treat Prophylactically with Homeopathy During Known Outbreaks of Infectious Diseases. Even as far back as the time of Hahnemann, homeopathy has been used as a preventive measure during known epidemics and has been shown to reduce both the incidence of diseases and the severity in people who do catch the illness. Treat Prophylactically with Homeopathy According to a Schedule. This in essence is similar to the vaccination process, but without the side effects of the vaccinations. It is important to note that homeopathic forms of the vaccines will not impart immunity as measured by blood anti-bodies. Nevertheless, in statistics compiled by an Australian Homeopath, Isaac Golden, this process still results in a reduction in disease incidence and severity. Golden’s work needs to be replicated and expanded, but this may be a better option if your child tends to be more sickly, or more strongly afflicted by illnesses. In all fairness, does that mean that all vaccines are necessarily bad? No, it doesn’t. For all I know, it may very well be possible that there are vaccines out there that really do work, i.e. prevent or cure rather than cause disease. I haven’t come across evidence of them yet but that doesn’t mean they are not there, now or in the future. The CDC, for one, claims there are some. I preserve an open mind so I’m open to new claims. However, I can tell you that I regard any and all substances that need to be injected into my body, and thereby bypassing any natural immunological responses, with extreme prejudice. History and common sense cannot help but disapprove of the use of vaccines. It’s a sad fact of life that a great number of people have lost faith in the ability of their own immune systems to stave off infectious diseases. The underlying rationale is based on insecurity and fear. And that’s a shame really because the human immune system, if working properly, is incredibly strong and effective in dealing with pathogens. It is much more natural to work on strengthening your immune system, through quality nutrition, proper hygiene etc., than to seek refuge to unnatural artificial means that precisely burden and undermine your immune system and only give temporary relief and protection, at best. LEICESTER: SANITATION versus VACCINATION – J.T. BIGGS J.P. I assume that the table has been imported in simple but proper format (each period covers one line, spaces between numbers, no letters, just numbers) into a file called biggs.dat, stored in the directory c:\\temp. The work of Doctor Andrew Moulden should drive the final nail in the evil barbaric practice of “vaccination”. Should the human race survive our Political Pandemic “vaccination” will surely be revealed as the nefarious plot it truly is. Doctor Moulden presents the indisputable forensic medical evidence for how ALL vaccinations are inducing the same harmful brain and body damages as wild polio virus did in the pre-vaccine era. The damages are being caused by an electrostatic as well as an immune induced hypersensitivity response that derails microscopic blood flow and fluid dynamics. We are seeing the exact same problems from infants to geriatrics. All vaccination produces micro strokes to the brain and elsewhere in your body. Most do not produce overt effects but ALL produce ischemia. Vaccinate enough and the harm becomes overt as in misaligned eyes or facial grimaces, can greatly harm as in autism or can kill as in SIDS. Can we reproduce an edited version of this analysis? Not sure when it could go up but your approach is interesting. By all means, go ahead… and thanks 🙂 Send me a link if done please. As an alternative to the worthless “vaccination” being pushed on us for the bio-engineered viruses please consider two vitamins to reinforce your immune system. Vitamin D: I take 10,000 IU of vitamin D3/day. Vitamin D is required to keep the virus from entering your deep lung tissue. With a good level of vitamin D in your blood your body produces the antimicrobial peptides which allow the interception and destruction of the viruses, ANY virus, in your upper respritaory tract BEFORE they can enter your deep lungs. A test of viral bio-weapons appears to have occurred in the Ukraine last flu season and hemorrhagic lung was the chief cause of death. I suspect hemorrhagic lung may be the chief threat during our Political Pandemic. Vitamin C: Vitamin C also aids your immune system in destroying virus invaders. Vitamin C is required to produce collagen. When you suffer massive tissue destruction such as during a serious viral infection, your vitamin C needs may exceed one gram/hour. In any case one gram/hour is a good place to start IMO. Did 1918 Spanish Flu Deaths Result From Aspirin-Induced Vitamin C Deficiency? Please read this insightful article. There is a very good chance the whole 1918 slaughter was a Rockefeller and Rothschilds induced event. Just as it is this time. It is clear to me that at a minimum vitamin C deficiency plays a LARGE role in virus death by hemorrhagic lung, IMO the chief threat from our Political Pandemic so far. Taking one gram of ascorbate/hour as advised in the virus fighting protocol, will stand you in good stead should you come down with a serious case of the flu. Of course large amounts of vitamin D should keep you from ever getting into a hemorrhagic lung situation. Should you or a loved one come down with hemorrhagic lung an IV vitamin C drip may be the only thing that can save you. Most hospitals will refuse to perform this IV vitamin C drip. When forced to do it a “lost” patient has often been saved. Nice article, can you check out my blog then? Take a look at wikipedia, JOHN PITCAIRN JR THE FALLACY OF VACCINATION! He was self made and through his wealth he realized that the medical professon relied heavily on vaccine for a large part of their income. In his statements he names doctors who also realize that there is no valid proof that any vacine has ever worked or ever will. These doctors believe now that they were decieved by government that was influenced by the politics of the chemical industry to tap into the wealth that would come from a mass innoculation program. These programs go back to the mid 1700s and were successful at causing disease like sicknesses that would start hysteria among the populous. What was interesting, was the fact that the so called disease only affected the poor and middle class, somehow the rich and elite were always spared? Personally I believe people have been decieved into the belief that their own body is not capable of healing itself, while animals in the wild remain healthy!